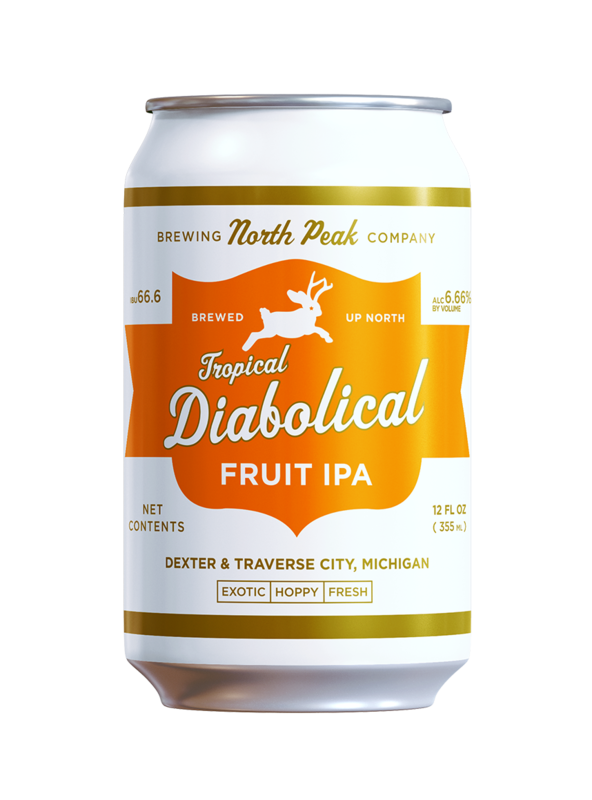 Tropical Diabolical — North Peak Brewing Co.
A take on our classic Diabolical IPA with a tropical twist. Brewed with generous amounts of passion fruit, pineapple, guava, tangerine and sweet orange peel combined with seven hop varietals for a hoppy bite and exotic flavors and aromas. Diabolical goes tropical for a limited time. Uncanny are a Jackalope’s abilities to mimic human voices. Ever evolving, they have come to mimic their human Michigander counterparts in other ways as well. Fleeing the North and escaping the endless winter woes for warmer, sunnier skies. But always returning come June, for summer in Northern Michigan trumps any tropical getaway. Jackalopes swim in the fresh clear waters of Lake Michigan and relax on northern white sandy beaches. And like the crafty creatures they are, tiki drinks are pushed aside for Jackalopes always opt for a tropical IPA on a hot summer day.